Get ready to meet four of your favorite Disney princesses on one dazzling SOFIA THE FIRST DVD: Dear Sofia: A Royal Collection. When it comes to adventure, Sofia is no stranger. Her family and friends are very important to her and she will do anything to make sure they are safe and happy. Dangerous mazes, Curses, and Spells, will not stop Sofia. Of course, being a princess is tough and sometimes she needs help. In this special DVD collection, Sofia gets help from Mulan, Jasmine, Tiana and Belle. 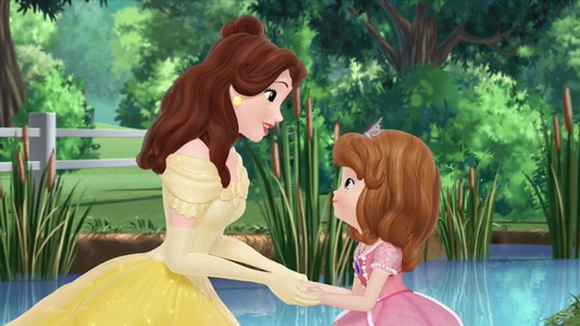 I have always been a Sofia the First fan because each episode has a life lesson to teach. From bravery to kindness, Sofia helps every child (or adult) watching to become a better person and care for those around them. Strength to go forward, conquering your fears, give from the heart, and actions speaking louder than words are only a few things Sofia teaches in these epic 4 episodes featuring Disney Princesses. When it comes to a Jade Jaguar, it takes a brave soul to traverse the dangerous path and save her family and friends. With the Help of Amber and Jun, all three princesses find themselves on a quest. But when they are trapped by several warrior statues it takes a special song from Mulan to teach them to never give up because the strength is inside you. After the encouragement from Mulan, Sofia, Amber and Jun swing past the statues, wave away moths, ride lizards and confront the Jade Jaguar. In the end they learn that they can do anything they put their mind to. Whether you are a princess, a girl or a child watching this adventurous episode, everyone has a lot of strength inside. You just have to keep moving forward and use your mind. Of course, fear can be a sudden adventure stopper. When Sofia and Amber get trapped in the hanging gardens in “Two to Tangu,” they must figure out a way to escape. But with a wild carpet that refuses to obey, it is harder than it sounds. It takes the amulet bringing Princess Jasmine to help the girls conquer their fear, tame the magic carpet and fly out of the hanging Gardens. This episode really focus on the fact that we should not be afraid of the unknown but jump right in. Fear can be a hindrance to all the fun we could have in life but if we follow our hearts and conquer our fears we may just be soaring through the clouds. Following ourheart can be tough when we are unsure about the reaction from others. Will they appreciate a gift we worked so hard on to give them with all our hearts? Sofia questioned this when she realized Cedric may not like the wand case she made for him for Wassailia Day. In an effort to give her friend a better gift, she goes on a hunt for Ice Lilies, which have become very rare. On her trip she runs into a Fawn named Winter who has an ice curse; everything she touches turns to ice. She must find the perfect gift to give Glacia the Ice Witch in order to reverse the curse. Together, Sofia and Winter, look for the Ice Lilies and bring them to Glacia. However, the Lilies are boring and not very special, making Glacia cranky and unkind. She instructs the pair to find another gift. Lost with no hope, Sofia’s amulet summons Princess Tiana. She explains that gifts from the heart, whether big or small, can be found inside us all because finding the perfect gift comes from the heart. Eventually, we all learn that it isn’t the size of the gift or where it was found, a gift given from the heart, whether homemade or bought, is special because it comes from you. Keeping this in mind, Sofia gives Cedric her homemade wand case and watches as her friend goes from disgust to absolute happiness. For Sofia, her friends happiness means the world to her, but even Sofia has her moments of mistakes. After all, no one is perfect. But what makes Sofia wonderful is what she does when she realizes she has done something wrong. In “The Amulet and the Anthem”, Sofia is picked to be the Enchancian Anthem Singer. All of a sudden she is surrounded by painters, interviewed and being treated like the most important person in Enchancia. It is all a little overwhelming and it goes straight to her head as she brags to her friends. Upon making her mistake, Sofia begins to croak like a frog. Cedric, in his own crazy way, tells Sofia she has been cursed for doing something bad. It surprises Sofia, but in an effort to make it right she retraces her steps to find where she went wrong. After she realizes it was her bragging to her friends that caused the curse she apologizes and asks for their forgiveness. When this still doesn’t release the curse, the amulet calls on Princess Belle to help Sofia see that actions do in fact speak louder than words. Instead of just saying she is sorry she needs to show it and do something great for her friends. With Belle’s help, Sofia brings her friends to the stage to sing the Anthem and her croak goes away. Along with all four Princess Episodes, Dear Sofia: A Royal Collection also comes with two bonus episodes. Follow Sofia in “Minimus is Missing” as she helps rescue all the stolen horses of the kingdom and where Amber must learn if you fall off a flying horse, you must get back on and try again. Sofia also dives deep once again to see all her mermaid friends in “Cool Hand Fluke.” Fluke is a merman who needs to be the center of attention. When Sofia begins taking it from him he gets reckless. Fluke must learn that everyone in the spotlight together is better than being in it alone. This DVD also comes with a wonderful “Letter to Sofia Kit” featuring a cute Pen, card, envelope and stickers (I love Stickers)! The card is double sided. One side has your child tell Sofia all about themselves, the other side lets them get creative and draw an interesting picture. Everything you need to write Sofia is included in the kit, well almost everything; you have to provide the stamp to mail it off. The cool part is, if you get the letter there before the end of December 2015, Your child may just get a response back from Sofia. Now that is exciting! Get more information about Dear Sofia on Disney Junior for Grown Ups. To purchase this movie and start your Sofia adventure with the kids, head over to amazon.com. It is certainly a must have for all the royalty in the house.